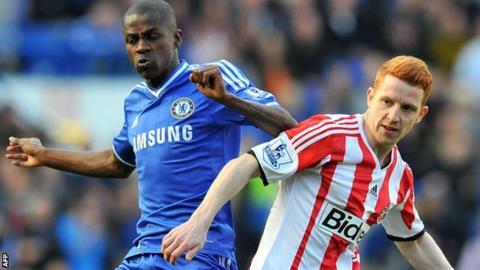 Chelsea midfielder Ramires will miss the rest of the Premier League season after accepting a charge of violent conduct. The Brazilian was sanctioned following an off-the-ball incident with Sebastian Larsson in Saturday's 2-1 defeat by Sunderland. The 27-year-old will serve a four-match ban after a review panel decision. Manager Jose Mourinho and assistant Rui Faria are also subject to Football Association charges from the match. Ramires elbowed Larsson towards the end of the first half at Stamford Bridge but was not punished at the time. But, after the incident was reviewed by a panel of former referees, Ramires will now miss Chelsea's remaining Premier League fixtures this term - against Liverpool, Norwich and Cardiff - as well as their first game of next season. He is, however, eligible for the second leg of Chelsea's Champions League semi-final against Atletico Madrid next Wednesday. Mourinho was charged with misconduct following comments he made after the match. Faria, who had to be restrained from confronting Dean after Sunderland had been awarded what turned out to the match-winning penalty, has been charged with two counts of misconduct. Both men have until 18:00 on Monday to respond to their charges.